Long after the Raffles Hotel has crumbled to dust and the Padang is a jungle of high-rises, pieces of Singapore's early history will continue to flutter and strut around its streets. Some of the island’s most common birds don't belong there at all. They are alien invaders, and over the decades they've hitched rides with humans to get to the island. Sometimes destined for dinner plates or for farmer's fields or simply to ease a new immigrant's longing for the birdsong of home... by ship and by air, by design and by accident, they made their ways to Singapore’s shores. Mynahs, sparrows, crows, and pigeons are just some of the ten to fifteen exotic species which now call Singapore home. They have also become its most visible avian residents. Their familiar presence reflects not only their skill in adapting to new environments, but represents different periods of Singaporean history. 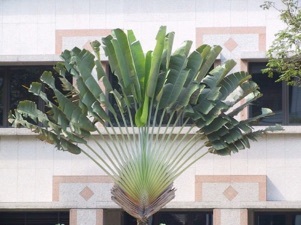 In that way they could bee seen as living artifacts of Singapore's colonial past. "It's hard to pinpoint the precise origin of these birds," says Navjot Sodhi of the Department of Biological Sciences at NUS. "But there are lots of interesting stories associated with their arrival here." Take the House Crow, for instance. This grey-bodied bird (distinct from the dark black native crow and much rarer Large-billed Crow) arrived in this part of the world in the early 1900s as a crude form of biological pest control. Native to Sri Lanka and India, House Crows were brought to what was then British Malaya in an effort to control crop-eating caterpillars. They flourished and quickly moved beyond the agricultural fields they'd been brought to protect. 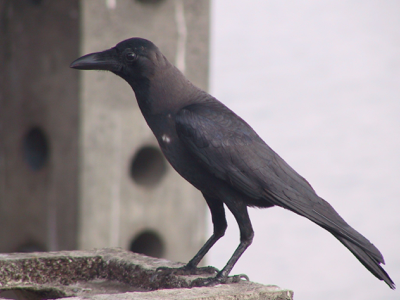 House Crows didn't arrive in Singapore until decades later. Several unsuccessful attempts were made to establish the species here, but it was only during the chaotic war years of the 1940s that the species finally took hold. Now you can find them everywhere across the island, roosting noisily in mangrove trees and rooting in dumpsters, a testimony to the species’ skill as a scavenger. Ironically, the once-useful immigrant is now routinely culled as a pest. However Nature does impose its limits. Populations can't expand their ranges uncontrollably. Climate and geography create barriers that are often impossible to overcome. A mountain range or a desert, an ocean or a river can effectively prevent a species from crossing into new territory. That's why tigers live in Sumatra but not in Borneo (the sea crossing is too much, even for strong-swimming felines) and what keeps polar bears in the arctic and kangaroos in Australia. This isolation of populations is also the main driving force behind the evolution of new species. But when humans enter the picture, all the rules of an ecosystem get thrown out. We bludgeon and modify the landscape into new forms, often driving out native species and creating perfect habitats for invaders. The widespread clearing of Singapore's forests was ideal for the Javan Munia, a small songbird which arrived there in the 1920s. As a specialist in eating the seeds of lawn grasses, it thrived in the altered habitat and has become today the island’s most common munia. Humans also disrupt ecosystems by bringing along these new species, either by accident or on purpose. A homesick Englishman in 1870s New York thought to introduce all the birds mentioned in Shakespeare’s plays into Central Park. Most died out after the first winter, but the European starlings did not. From a handful of birds released originally, they spread across the continent from Miami to Alaska, and now number in the hundreds of millions. The White-vented Mynah, an everyday sight here from hawker stalls to city parks, is thought to have been introduced by a man involved in the caged-bird trade back in 1920. Even Sulpur-crested Cockatoos, natives of Australia, have established themselves in Singapore forests from once-captive ancestors. Unfortunately, such ecological disruptions often come at the expense of native species. Unchecked by predators or local competitors, an alien species can sometimes spread wildly out of control. Consider the rabbits in Australia or the eucalyptus trees in California, both of which became a local scourge after innocent or well-meaning introductions. The result? Extinctions. Sometimes on a massive scale. Hawaii was once considered among the world's richest reservoirs of unique bird life, but only 35% of the native bird species are alive today. Landscape changes, disease, predators, and competition from introduced species have wiped out the majority. Singapore has lost 106 (about 30%) of the bird species that were recorded here a century ago. And the process of alien invasion hasn't stopped by any means. One of the most recent arrivals -- the European House sparrow -- is still confined to the Pasir Panjang wet markets where it appeared a decade ago (presumably with a shipment of produce.) But judging by this same bird's success as an immigrant to North America and Australia, it might soon be a common resident across the island. So the next time you're awakened by the noisy dawn chortling of the Koel, consider the fact that you’ve met yet another recent immigrant. In just a decade this crow-sized bird managed to colonise the entire Malay peninsula, partly because it takes over the nests of crows and mynahs, turning those unwary residents into hapless surrogate parents - much as cuckoos do in Europe. Mirroring its human populace, arrivals past and present make up the increasingly cosmpolitan look of Singapore's birds. For better or worse, these alien invaders are here to stay, each one of them contributing a colourful immigration story to Singapore's history. An earlier version of this appeared in Project Eyeball. 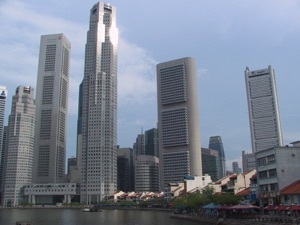 Singapore - not quite the way it used to be. Dispersal, with a little help from humanity. 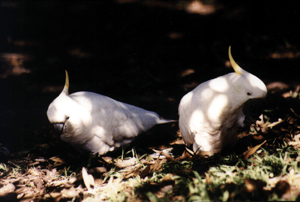 Even Australian Sulphur-crested Cockatoos are established in some forest areas.